We started profiling famous farriers a few months ago, beginning with American Legends like William “Jelly” Caulder, Bob Waters, Ronald “Tex” Cauthon, and Vern Hornquist. Now it’s time to honor our European legacies. We tip our hats to these foreign farriers, as recognized by the International Horseshoeing Hall of Fame. Learning the trade from their father Jim started shoeing at age 14, and Allan began at 11 years old. Going on to establish the J & A Ferrie Farriers & Farrier Suppliers in 1982, the two have made a lasting mark on the Scottish farrier business. In the years since founding, both brothers have competed in the World Horseshoeing Championships, attained Worshipful Company of Farrier Fellowship status, along with being appointed Examiners and Judges of the Company, and have trained over 30 apprentices. In 2013, after 43 years in the business, the J & A Ferrie business lives on, albeit with a lesser role from the two brothers. Both brother’s continue to shoe at a slower pace, with Jim taking working in Perth and at the Glasgow Vet School, and Allan continuing to work locally. You can visit their site online here. As a fourth-generation farrier, Gran Moon is a true competitor. He is a six-time World Champion of the World Horseshoeing Championships at the Calgary Stampede. Known as both a great coach, and a great competitor, Moon can often been seen helping his competition with new techniques, right before competing against them. An avid perfectionist of the craft, he can be found practicing forging techniques long after the regular work day. Other accolades include earning his AWCF and CJF, being a four time member of the American Farriers Team and a five time member of the Welsh Farrier team. Enjoy his skill in action, with a large selection of online farrier videos available on Hoofwatch – here. 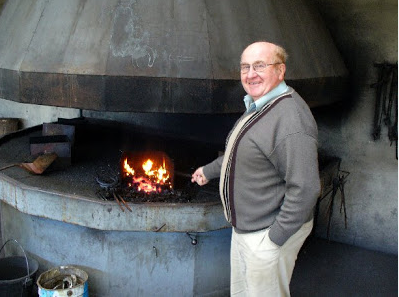 From serving as President of the European Federation of Farriers Associations, to obtaining one of the most difficult credentials in the world – a Fellow of the Worshipful Company of Farriers, David is a true legend in his own time. Working in the trade in a variety of industries from civilian life to the British Amy, to supporting the National Association of Farriers, Blacksmiths, and Agricultural Engineers his diversity of experience is remarkable. 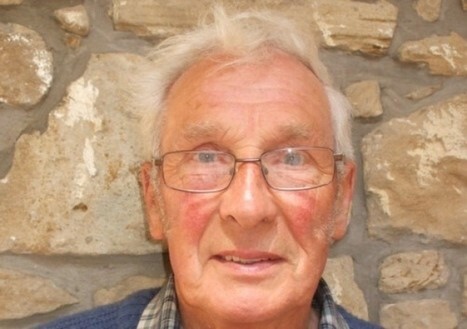 David’s work is renowned for his dedication to the welfare of horses, encouraging the highest standards in trimming and shoeing. 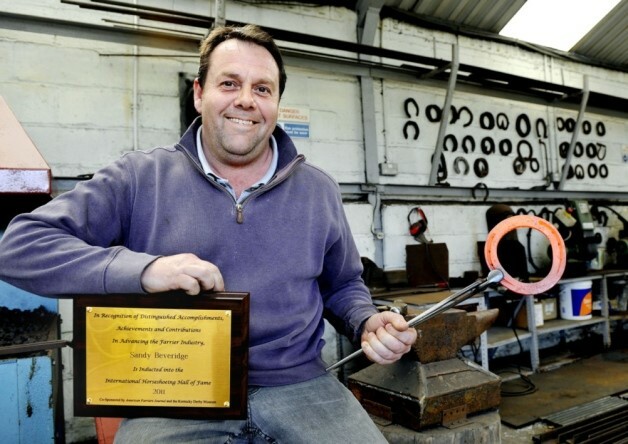 These high standards are evidence in his long dedication to training new apprentices and producing champion quality farriers through his teaching. Recently David was a guest speaker for the J.C. Milton Australia Clinic Tour. Most recently in the news at the World Equestrian Games in Normandy, in August 2014, Haydn Price is a strong presence in the European farrier world. 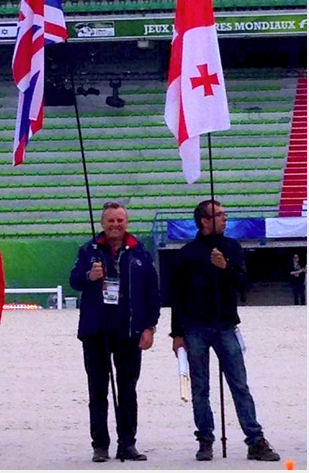 Shown here holding the British Team flag in the arena Price is a consultant farrier to Team GBR and a provider of farrier services to the BEF;s World Class Performance program. Well known to the British Equestrian Federation, Price received the BEF Medal of Honor in 2011. “APPARENTLY IT IS IN RECOGNITION OF SOMETHING CALLED ‘DOING YOUR JOB, BUT I WAS VERY HUMBLED TO BE AWARDED IT A VERY, VERY HAPPY.” HAYDN ON THE BEF MEDAL. Hear about his life as a farrier in his own words, in this video series here. David Wilson is well-known in the World Horseshoeing Championship at the Calgary Stamped. As a champion in 1985, he has gone on to judge the competition 5 times. Continuing a long line of Wilson farriers, David is the 6th generation to continue a tradition started in 1813. The tradition continues on with his grandson Josh representing the 8th generation of champion level farriers. “I’VE JUDGED IT FOUR TIMES AND THOUGHT THAT WOULD BE IT.” WILSON, ON HIS 2012 JUDGING OF THE COMPETITION . Wilson’s fifth time judging was a record setting honor at the Stampede’s centenary event in 2012. The event attracts over one million visitors per year, including a grandstand that can hold 70,000 alone, and has been attended by celebrities of all kinds, including the Duke and Duchess of Cambridge. Out of 2500 UK farriers, only 32 have gotten a fellowship (as of 2011) and since the UK is a world leader in farrier training and techniques, this means everyone wants to train with the best. Beveridge certainly classifies as one of the best, having worked his horseshoeing skills across the UK, Canada, Ireland, America, and even for a Sheikh in Dubai. He says that one of his best experiences ever was when Sheikh Mahmood invited him to Dubai to shoe a horse for the Dubai World Cup in 1998. “OF COURSE IT’S A MASSIVE HONOUR FOR ME. WHAT MADE IT MORE SPECIAL WAS THAT YOU HAD TO BE NOMINATED BY SOMEONE AND YOUR NAME PUT FORWARD TO THE JUDGING PANEL.” BEVERIDGE ON HIS INDUCTION TO THE 2011 INTERNATIONAL HORSESHOEING HALL OF FAME. Beginning his career in 1980 as an apprentice to the famous Ferrie brothers, he earned his diploma from the Worshipful Company of Farriers in 1984, and an Associateship in 1988. Beveridge moved on to become one of the youngest ever WCF Fellowship recipients ever, and acted as an examiner for over 20 years. He trained 8 apprentices so far, as of 2010.